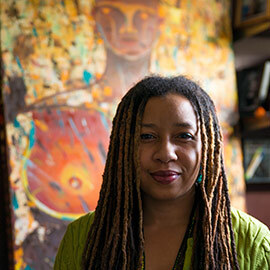 Laura Mae Lindo, director of Laurier’s Diversity and Equity Office, was one of several prominent speakers invited to address a gathering at Kitchener City Hall March 11 to celebrate International Women’s Day. The event — called Nevertheless, She Persisted — was covered by CTV. Below is Lindo’s address, which includes a reading from an article she published and a letter to her daughters and her son. What an honour it is to share this space with you today as we stand together on the traditional territory of the Neutral, Anishnawbe, and Haudenosaunee peoples. We stand together today on the Haldiman Tract which extends to six miles on either side of the Grand River, from the mouth at Lake Erie, to the source at Flesherton/Maple Valley. I would like to thank my Indigenous family and friends for teaching me the art of persistence (which some call the art of “resistance”). As a black woman working in a senior level position in the postsecondary sector, I am often approached by my younger sisters, women of colour who, like me, seek the mentorship and encouragement of another black or brown woman who has “made it,” a black or brown woman who can tell us the secrets of persistence, the secrets of resistance as we navigate systems like those which frame the educational sector more broadly and that were not built with our needs in mind. It is important to note that on Canadian soil people who looked like me, whose ancestry was similar to my own, whose elders were Queens of African Empires and whose stories of enslavement have been transformed into slaves narratives as if it was the destiny of our Queens to be slaves. This modification, this transmutation, or this mere mutation of the lived realities of our ancestors places the pain and turmoil of slavery within the souls of my ancestors, denying their plight as “necessary to their present circumstances” rather than indicative of the struggles against which they resist. When my young sisters find me, seeking mentorship and guidance from a black woman to a black woman, I am often struck by how rapidly my thoughts drift to a single story. A moment in time that propelled me here. It was the day I was told that I was “not U of T material.” I wrote about it first a decade ago, in 2007, and was asked to republish my story once again in 2015. I hope you do not mind my sharing of this tale with you here today. Reading from my article, “Whiteness and Philosophy” in Revisiting The Great White North? (pp. 229-238). Sense Publishers. It was 1998. A young student walked down the lonely halls of the university eager to collect the final piece for her graduate school application. Classes were out, and only a few stray students remained scattered across campus preparing for final exams. She quickened her step, pushing a twist out of her eye to check the office numbers. She knocked on the door of room 223. “Come in,” a voice answered from inside the office. “Can I help you?” the professor asked as she opened the door and walked into the small room. She noted a distance in the professor’s tone but chalked it up to the pressures of marking final papers and exams as well as the mountain of reference letters that he probably needed to complete for his many students, including her. He was the graduate program director in the Department of Philosophy, after all. “Hi there,” she began, “I just came by to grab the reference letters.” She tried to sound as confident as possible but something wasn’t right. She was shocked and experienced the unfolding scene in devastating silence. It was as though she was living this event from a third-person perspective. It was all she could do from fainting. She tried to remain calm. She tried to keep cool. She prayed that the tears that began welling behind her eyelids would not come pouring forth, but she was unable to pretend that what she was experiencing was not affecting her. He interrupted her, throwing a box of tissues across his desk. “Sit down,” he commanded. In her shock she complied, not knowing what else to do. “Why do you want to go to graduate school anyway?” he demanded. “I want to become a professor and teach Philosophy at a university. How can I do that if I don’t apply for graduate school? I’m a straight A student and I haven’t gotten less than an A in any of the assignments in your classes. How much more do I need to do to be university material?” She was still having a difficult time processing his tone and the language he used with her. She had stopped listening. A single question struggled to be voiced, but she had been taught not to consider circumstances such as these to be connected to her own black, female body. Such thoughts ran counter to the rigid vision of multiculturalism that she had been taught to accept since she was in elementary school. So she did the only thing that she knew how to do. She collected her things. She thanked him for his time. She left the office, took a deep breath, and began making her way off campus, and out of the only intellectual embrace she had known in her entire university career – Philosophy. I stand with you today as the director, Diversity and Equity, at Wilfrid Laurier University. And from this space I feel that I must juxtapose my story of “arrival” in the academy with a simple note of caution. Today, we are living at a time when, more and more, tales of our pain are turned around and used in troubling ways. We are told that these negative experiences should be seen as “good,” as “integral to our growth," as “integral to our stories of arrival” or a “sign of our resilience.” But I would not have to be resilient if the systemic change I sought was attained. Narratives of resilience, while moving and encouraging, also suggest that the world – the systems in which we live – will forever remain the same. Presented as encouragement, I cannot count the number of times that I have heard these words. But can we truly call this encouragement? Is the pain born of my resilience as a black woman and your hatred of the same something that I must endure for the betterment of my “self," of my “people"? Nevertheless, she persisted. I persisted and in my state of perpetual resistance I wrote a letter to my daughters and my son just this morning to challenge this typical approach to encouragement and to replace it with something much more powerful – to challenge it with love. I was reading this morning about Audre Lorde, a black, queer, feminist, civil rights activist and poet who died in 1992 but whose work makes me excited about my work. She was born in February, just like you, Sofia, the day before Grandma’s birthday (Audre Lorde was born on Feb. 18, my mother on Feb. 19 and my Grandmother on Feb. 13 and Danica, your due date was Feb. 29 – a leap year no less). February sure is a powerful month for powerful black women, wouldn’t you say? This morning I looked up Audre Lorde on Wikipedia (yes, I know as an “academic” this is not the best source, but as a mother I know what my kids are looking at when they do their preliminary research, so let’s just work with it!). The Wikipedia entry included a quote from Sister Outsider: Essays and Speeches, "Those of us who stand outside the circle of this society's definition of acceptable women; those of us who have been forged in the crucibles of difference — those of us who are poor, who are lesbians, who are black, who are older — know that survival is not an academic skill. It is learning how to take our differences and make them strengths. For the master's tools will never dismantle the master's house. They may allow us temporarily to beat him at his own game, but they will never enable us to bring about genuine change. And this fact is only threatening to those women who still define the master's house as their only source of support." I want you to remember today – the day that you have joined me to celebrate International Women’s Day – that your ability to recognize problems in the system is your strength. I want you to know that your strength is necessary in this journey as we challenge those around us to do better. I want you to know that your courage alone to speak up in the face of social injustice is your strength, and not your shame. I want you to know that this fight for equality of women’s rights, is also our fight for the equality of black women’s rights, and that no matter how many times you are told that a “partial win” on this front is still a win, that it is okay to say no. It is okay to say that, “I am not free while any woman is unfree, even when her shackles are very different from my own.” (Audre Lorde). Because Audre Lorde laid the groundwork for your persistence before you, and, as your mommy, I am saying this too. And to the rest of us who have gathered today to celebrate our persistence, I would like you to know that I see you, and I am grateful for every act of resistance that you create.